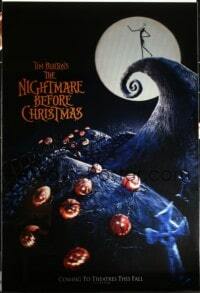 2z021 NIGHTMARE BEFORE CHRISTMAS lenticular 1sh 1993 Tim Burton, Disney, Halloween, ultra-rare! Important Added Info: Note that this is an extremely rare first release lenticular poster for this movie! We have never auctioned one in all our years of auctioning. It is somewhat "dark" in appearance and was meant to be lighted from the back for full effect (see our image). Also note that this is a lenticular poster. First made on rare occasions in the 1960s, lenticular posters are posters that have a "3-dimensional" look to them, and when you look at them from a slight angle, they look one way, and then when you look at them from a different angle, they look entirely different! It is said that not that many of each lenticular poster was made, likely due to the added cost of production. They can be easily damaged, and cannot be rolled tightly, as can a regular printed poster. We have provided two images of this poster, both shot at angles, to allow you to see what "both" images look like, but please remember that you are bidding on a single poster, NOT two posters! Finally, note that this lenticular poster is on a heavy sheet of plastic that is approximately 1/4" thick, and CAN'T be rolled. Please consider the added cost of shipping before bidding on this poster! Note that this item needs to be shipped in an oversized flat package. Most of these items absolutely can only be sent in flat packages, and could not possibly be rolled into a tube. Some of them might SEEM like they could be rolled in a tube, like a half-sheet, but they can't. The reason these items are in this auction is specifically because they CAN'T be rolled (because rolling any of them would damage them, even if they somehow can be rolled). So please bear in mind that this item must be sent in a LARGE flat package (the size of the package will depend on the size of the item when ready for shipping), and bear this added expense in mind before placing a bid on it. Condition: good to very good. The poster is printed in a VERY HEAVY and thick material (see above). It has scuff marks scattered in various areas and a few "dents" in just a few areas. It is otherwise in generally nice condition.